In our top-to-bottom perspective of a PV system, we need to look at one more component usually located on the roof. This is the PV source-circuit combiner and it will be followed in the dc circuit by the PV dc disconnecting means. The PV source-circuit combiner is found on larger residential systems and on most large commercial systems. PV systems that have a dc rating above about 6 kW may have sufficiently large numbers of modules that more than two strings of modules are required to get the desired array power. Since module voltages range widely and module power ratings can vary from 40 watts to 300 watts, there are no hard and fast rules relating the need for a dc combiner to a specific number of modules in an array. The rated output voltage of the PV modules and the inverter dc input characteristics determine how many modules may be connected in a series string. See “PV Math” in the January-February 2009IAEI News.The power rating of each module and the number of modules in a string determine the power rating of a string. 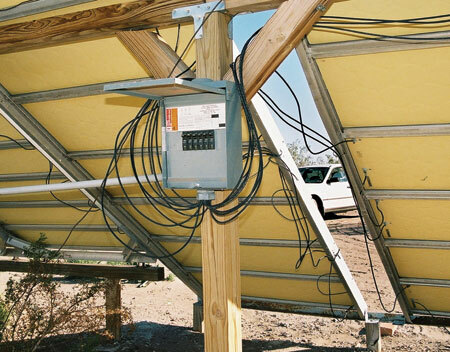 The desired array power rating and the power rating of the inverter determine how many strings can be connected in parallel. Normally two strings can be connected in parallel without requiring a combiner containing overcurrent devices [See 690.9(A) Ex]. If more than two strings are needed, then overcurrent protection on each string may be required and these overcurrent devices are placed in a PV source-circuit combiner. See “Questions from the AHJ—To Fuse or Not to Fuse” in the May-June 2008 IAEI News for the details. A combiner may use either fuses (typically on high-voltage, utility-interactive systems) or circuit breakers (used on systems operating at a nominal 48 volts or below). [See photos 1, 2, and 3]. It should be noted that the combiners shown in photos 1 and 3 have exposed circuit terminals and busbars near the overcurrent devices. They are not dead front when opened, and voltages on the exposed terminals and busbars may approach 600 volts on many systems in cold weather. Although not dead front, these combiners meet the “intent” of the NEC where a tool is required to get access to energized surfaces (terminals and busbars). In these cases, the combiners have screw-on covers and the tool required to open the combiner is a screwdriver. NEC-2008 requires that combiners be listed and UL has determined that the listing must be to UL Standard 1741 (the PV inverter standard) [690.4(D)]. Although listing is required, UL 1741 has not yet been modified to specifically require that combiners be dead front. Some of the newer units are dead front, and eventually that requirement will be in the standard. See photo 4 of a dead front unit that has terminal covers made of clear plastic. Although the conductors between the modules and the return circuit from one end of a string to the other are permitted to be single conductor cables in free air, as soon as these circuits leave the array location they must transition to a standard chapter 3 wiring method. That wiring method must be suitable for the hot, wet environment found on roofs, and sunlight resistance is also a must. Electrical metallic tubing (EMT) is frequently used. The ampacity of the conductors is based on the short-circuit current being carried in that circuit and must be corrected for the conditions of use. In many cases, terminal temperature limitations on combiners or fused disconnects may dictate further ampacity corrections. See the “The Nature of the PV Module: Limited Currents Have Benefits and Drawbacks,” September-October 2007 IAEI News for more details. An equipment grounding conductor should be run with the circuit conductors in the conduit. Where the PV source circuits are unfused, the size under the 2005 NEC was based on 125 percent of the rated short-circuit current (Isc) for the circuit. In the 2008 NEC, Isc is used directly in Table 250.122 to select an equipment-grounding conductor. The reduction in size of the dc equipment-grounding conductor is due to the 2008 NEC requirement that nearly all PV systems have ground-fault detectors that will limit ground-fault currents in the equipment grounding conductors. On systems with PV source or output circuit fuses, the normal procedure of using the fuse value in Table 250.122 is used (690.45). In many systems, the equipment grounding conductors may be as small as 14 AWG between the PV modules. However, in areas where winds, snow, ice and other environmental factors are significant, a larger equipment grounding conductor should be considered to provide additional mechanical protection (690.46). 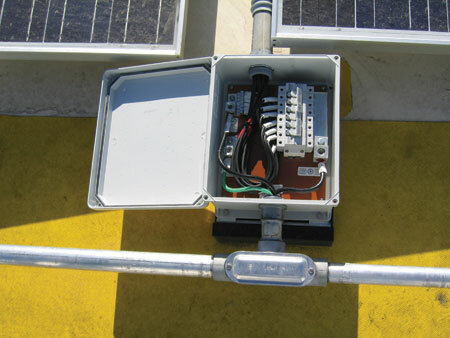 The dc PV disconnecting means (PV disconnect) should be installed in a readily accessible location, either inside or outside the building at the point of first penetration of the conductors (690.14) (photo 5). Since Section 690.31(E) allows the PV source or output conductors to penetrate the building surface on the roof (if they are routed in a metal raceway inside the building), it appears that the PV disconnect can be mounted inside the building in any readily accessible location. However, this NEC allowance may not be the safest option or even very clearly defined in the national Code. This parallel wording of 690.14(C)(1) to the requirements for the ac service disconnecting means 230.70(A)(1) may need further examination since in the world of ac utility-power, removal of the ac revenue meter can effectively disable the ac power in a structure where the ac service disconnect is inside a locked structure. With a dc PV disconnect inside a locked structure, the readily accessible definition may not be appropriate. 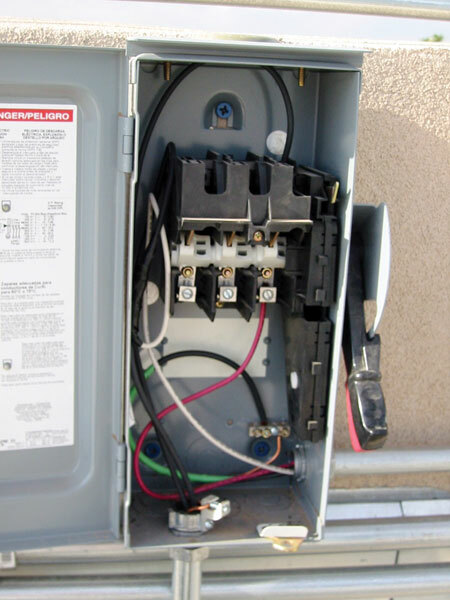 Many jurisdictions require that the PV disconnect be located within sight of the ac service disconnect or meter on residences. This is usually on the outside of the building. On commercial buildings, the PV system may be some distance from the ac service disconnect, and a directory may be used to show the location of all disconnects, both ac and dc (705.10). The disconnect should break all ungrounded conductors, but should not open a grounded conductor. Grounded conductors in PV systems may be either the negative or positive source-circuit conductors and should have white insulation, or where larger than 6 AWG, be marked with a white marking. The type of module used determines which circuit conductor should be grounded and the inverter must be compatible with that polarity of grounded conductor. The dc bonding jumper in a utility-interactive PV system is commonly inside the inverter and is a part of the ground-fault detection/interruption systems required by 690.5. If the grounded source-circuit conductor is opened by the switch in the disconnect, the marked grounded conductor becomes ungrounded and may be energized with respect to ground up to the open-circuit voltage of the system. 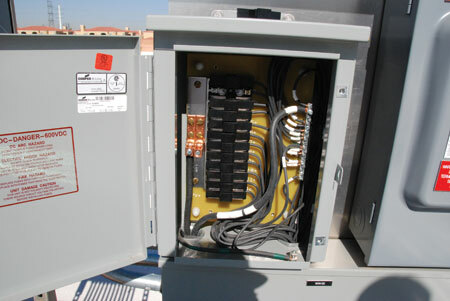 This represents an unsafe condition for people servicing the PV array and for that reason the Code prohibits the use of disconnects, breakers or fuses in grounded PV dc conductors unless they are part of an automatic ground-fault detection/interruption system (690.13). Photo 6 shows the front of a PV dc disconnect with the labels required by 690.17 and 690. 53. 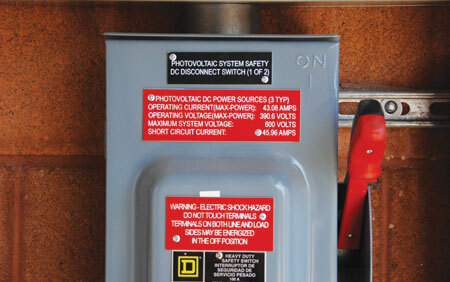 The 690.17 warning is required because the load terminals of this disconnect are connected to the inverter dc input which may be energized for up to five minutes after the disconnect has been opened. The filter and energy storage capacitors in the inverter will be discharged after this time. The 690.53 label with the dc voltage and current ratings will allow the AHJ to determine if the correct cables have been installed. Power flow in a PV system is from the PV array through the dc PV disconnect, the inverter, the ac disconnect and finally to the grid. This power flow sometimes confuses installers on how to properly connect the dc and ac disconnects. 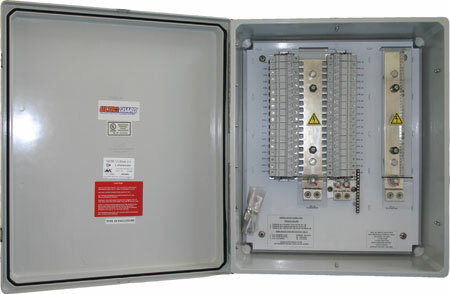 Note the upper line-side terminals on the disconnect shown in photo 7 are covered by an insulated cover. Also note the switchblades, the fuse holder terminals (if any), and the load-side lower terminals are exposed and easily touched. A general safety rule is that the most dangerous circuits should be connected to the protected line-side terminals. If this is done, it is less likely that energized terminal connections will be accidentally touched when the door of the disconnect is open. In the PV dc disconnect, the PV source or output circuits should always be connected to the line-side terminals. The dc input to the inverter is connected to the load-side terminals and the 690.17 warning label is required as shown in photo 6. For the ac PV disconnect the circuit connected to the utility source should be the line side of the disconnect with the inverter ac output connected to the load side. No warning label is required because, when the disconnect is opened, the inverter ceases to produce power within a fraction of a second and the exposed load side terminals pose no shock hazard. Attention to theCoderequirements in 690 and other articles plus an understanding of PV equipment and how power flows in a PV system should enable these systems to be installed and operated in a safe manner. 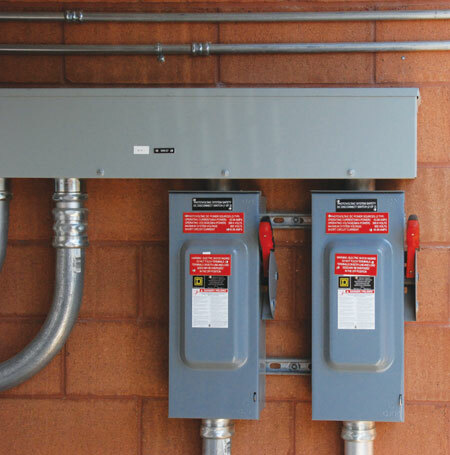 The utility-interactive inverter is next on our top-to-bottom tour of the PV system. The author makes 6–8 hour presentations on “PV Systems and the NEC” to groups of 60 or more inspectors, electricians, electrical contractors, and PV professionals for a very nominal cost on an as-requested basis. A schedule of future presentations can be found on the IEE/SWTDI web site. Why are We Here? And Where Will We Be Tomorrow?